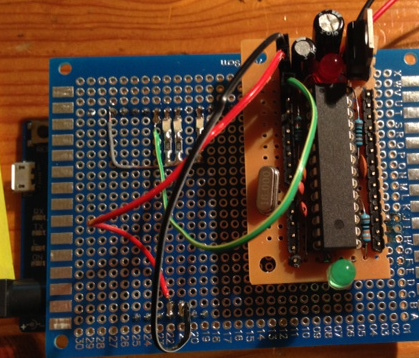 Recently I made a Yabbas arduino system ; this is a low cost arduino (7€) you can DIY. I’ve made it with a group of people from my city (look here) and my daughter. During this session we have finished the prototype but not had the time to flash the AtMega328P. 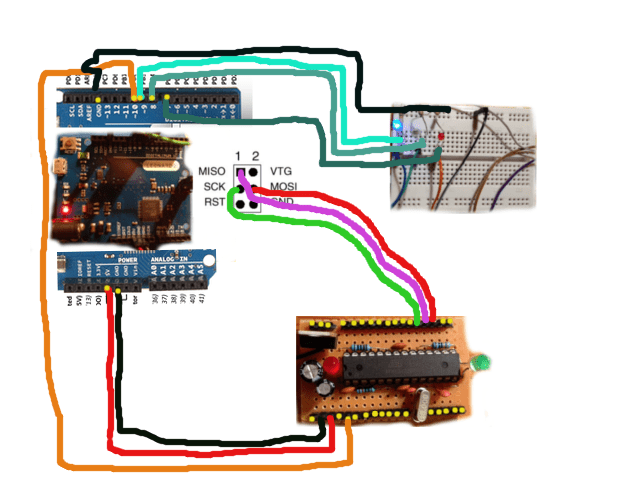 Ardino can be used as a AtMega programmer by using a ArduinoISP sketch. This one is provided through the Examples. Next you have to burn this sketch. Firstly you have to select the target (Leonardo), going Tool >> Board >> Arduino Leonardo then select the right serial port. One done you can upload the sketch to the board. During burn, you should see Yabbas green led blinking fast. There is also another way to burn the bootloader manually by using avrdude directly on command line. This entry was posted in Hardware and tagged arduino, atmega328P, IoT, isp, yabbas. Bookmark the permalink.